"Ésta es la granja Los Manzanos." A colourful sticker book to help preschool children learn common Spanish words and phrases with Poppy and Sam and the animals from the Farmyard Tales series. Each double page shows a busy Farmyard Tales scene with pictures of animals, toys and food labelled with their names in Spanish. 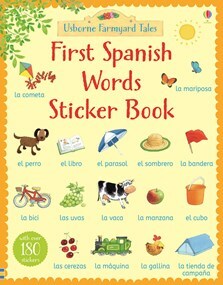 Children can listen to the words read by a native Spanish speaker at the Usborne Quicklinks Website.